Magic is in the air...and it's downright terrifying. In my many years of watching TV, there has always been a constant when magic comes into play: Never do a love spell! Seriously, it's dangerous. Just look at Buffy the Vampire Slayer Season 2 Episode 16! One little spell can muster a guilty pleasure episode, but it's also one about which many fans have mixed feelings. Let's find out why by rewatching "Bewitched, Bothered and Bewildered." Buffy the Vampire Slayer Season 2 Episode 16 was when Cordelia and Xander's relationship became official. Like, it was official official. If social media was around at this time, their first couple photo would be going up on Instagram right now with a cringe-worthy hashtag. Still, what should be an easy decision for them felt like a chapter from Romeo and Juliet or West Side Story. They had to grow and overcome the challenges from their friend cliques to be together. From the outside, it was a tad heavy-handed. Couldn't they just be together? Obviously, I'm saying this as a 27-year-old as compared to a 7-year-old who watched it the first time around back in 1998. If I were still a kid, I wouldn't have had the guts to make that tough decision. Even Buffy's jabs at Xander would've been enough to make me doubt. Xander: When are you guys gonna stop making fun of me for dating Cordelia? Buffy: I'm sorry, but never. I just think you could find somebody more...better. Xander: A parallel universe maybe. Here the only other person I’m interested in is...unavailable. Permalink: I just think you could find somebody more...better. The worst was the treatment Cordelia got from her minions. Cold shoulders and potential exile are scary in high school; no one wants to mess with that even now. And it's especially pressing for a character like Cordelia who values that hierarchy/status. Though, Harmony and the Cordettes were being exceptionally mean here. If this was a huge issue to them, why did it take all this time for them to stand up to Cordelia? Harmony doesn't seem like the type of person to keep her frustrations in, especially if her friend was dating someone she didn't like. Poor Jenny. She wanted to be with Giles so bad, but he wouldn't forgive her at this point. She's a Scoobie without the Mystery Crew. As I mentioned in the rewatch for Buffy the Vampire Slayer Season 2 Episode 14, if Jenny had only told the truth then, her exile wouldn't have happened. I can't wait until she's back with the group. Her relationship with Giles is still one of my favorites after all this time. At least she doesn't have to deal with an ex like Angelus. His torment of Buffy with the roses was cruel. Angelus clearly loved playing mind games when toying with his prey, and the roses were perfect fodder. Though, I never will understand why he didn't just turn Buffy into a vampire? Even as an evil vampire, he still loved her. It didn't make sense. Spike even noticed the procrastination in his actions of wanting to kill the Slayer. Let's be real; Angelus didn't want Buffy dead. Though, I felt terrible for him when Cordelia ended things. He was excited to give her the silver heart and take a chance on a real relationship. He was making a mature next step. Instead, he got shut down hard. That scene, and the treatment he got at school afterward by Harmony and the classmates made me have some sympathy for him. If there was any doubt about his feelings for Cordelia, this proved his case. I loved seeing Amy again! The last time we saw her was during Buffy the Vampire Slayer Season 1 Episode 3 when magic was the focus of the week. Having her around, and involved in using magic like her mother, brought the concept back into the series. 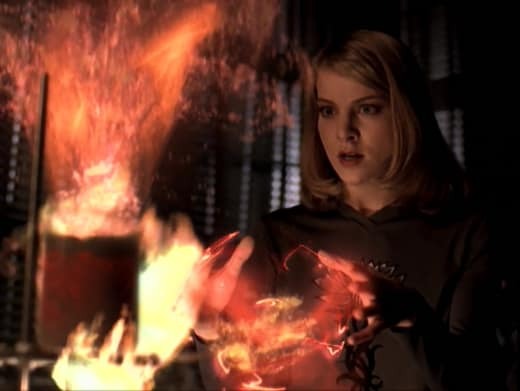 For fans already familiar with Buffy the Vampire Slayer, magic was an essential part of the show and Willow's development. This supernatural element felt right at home. Xander seemed like a character desperate enough to get revenge with magic. He didn't care about what trouble he caused; he only wanted to get back with Cordelia and get even. So, him using blackmail against Amy to perform this spell suited his character pretty well. The spell backfiring was the perfect twist. Magic is all about intent and the emotion behind it. Xander being angry and scornful threw everything for a loop; it's no wonder it worked in the opposite way. Cordelia rebuffing him and being unaffected showed that you couldn't force your way and get what you want. He got his worst nightmare instead. It's a good 'moral of the story' moment, but we're talking about Buffy the Vampire Slayer here, it's never that easy. Xander: Amy! Good to see you! You're a witch! Amy: No, I'm not! That was my mom, remember? Xander: Yeah, I'm thinking it runs in the family. I saw you working that mojo on Miss Beakman. Maybe I should go tell somebody about that? Amy: What...that's not even...that is so mean! Xander: Blackmail is such an ugly word. Amy: I didn't say blackmail. Xander: Yeah, but I'm about to blackmail you, so I thought I'd bring it up. Permalink: Blackmail is such an ugly word. Did you figure something was wrong with the spell the instant Buffy started flirting with Xander? Her seduction was the red flag for me. Their friendship had already eliminated any potential of Buffy being interested in him romantically; we had already crossed that bridge early into Buffy the Vampire Slayer Season 2. When she started teasing him back, it was clear something was off. A clear-headed person would've realized this right away. Though, this was Xander, and he wanted Buffy. If Amy and the random girl hadn't tipped him off that the spell went haywire, he would've gone for it. I'm pleased this scene wasn't explored further, and that he didn't take Willow, Amy or any other girl up on their offer. Xander making the spell was cliche, but doing more would've crossed the line and taken the character to a point from which he never would've been able to come back. If we had to map out the progression of the love spell, Jenny's arrival in the library had to be at the obsession stage. Everyone started acting more irrationally and volatile at this point. And, as viewers, we could see Jenny transitioning quickly through the stages of obsession after interacting with Xander. She was drowning in obsession...and I don't mean the fragrance from Calvin Klein. Giles was so furious with Xander's stupidity. He knew a love spell was a bad idea; the adverse effects it caused to anyone under its power were more dangerous than any demon. He had the right idea to take Jenny away. Giles: I cannot believe that you are fool enough to do something like this. Xander: Oh, no, I'm twice the fool it takes to do something like this. Giles: Has Amy tried to reverse the spell? Xander: When I get around Amy, all she wants to do is talk honeymoon plans. Permalink: I cannot believe that you are fool enough to do something like this. Buffy turning into the rat, and then going back to normal later on, left me with more questions after rewatching Buffy the Vampire Slayer Season 2 Episode 16. There will be a plot that comes up during Buffy the Vampire Slayer Season 3 when someone becomes a rat. In fact, that person got trapped like a rat permanently for many seasons. Here, Buffy was easily brought back to normal. Is it because Amy knew the spell? Was it a reversal after the love spell was stopped? Was it a hard spell to reverse? At this stage, magic was still new to the characters. However, this curse proves to be a tough one, later on, to be reversed. I'll have to dig into this, but something doesn't feel right about this rat spell. Willow holding the ax is an iconic visual. It perfectly sums up how volatile those affected under the love spell were at this stage. She and her angry mob would've killed Cordelia if they had the chance. Though, I couldn't help but laugh seeing Willow and Harmony fight over the ax. These two characters aren't prolific fighters, so it's funny to see them cause a riot in the quad of Sunnydale High. The spell reached new levels of creepy when Joyce got affected. Its power only took a few minutes for her to reach the violent obsession stage before she was ready to attack. When she broke through the window, did it remind anyone else of The Shining? I was waiting for a "Here's Johnny!" line to come up. Drusilla being affected by the curse, on the other hand, was an interesting development. Buffy the Vampire Slayer has toyed with the concept of supernatural beings and magic/abilities. Later in Buffy the Vampire Slayer Season 3, we'll see that vampires aren't affected by mindreading abilities. However, in this case, Drusilla fell under the spell's power this time around. There are two trains of thought here: (1) Her role could've been merely a plot device used by the writers to save Xander, or (2) maybe vampires can be affected by these types of spells? I think it's more of the former than the latter. Drusilla: Your face is a poem. I can read it. Xander: Really? It doesn't say "spare me" by any chance? Drusilla: Shhh...how do you feel about eternal life? Xander: We couldn't just start with a coffee? A movie, maybe? Permalink: Your face is a poem. We can add the love spell mishap to the long list of supernatural events that the residents of Sunnydale pretend never happened. After all these fits of amnesia and blissful ignorance, they should at least be somewhat aware of the supernatural elements happening in their town. Case in point: Buffy even admits that she remembers being head over heels for Xander. With most of the female student body falling under the spell, the exposure of magic seemed a tad high here. Magic may not have been top of their mind, but this event had to be big enough to open their eyes that something was amiss. Cordelia: Harmony, shut up! Do you know what you are, Harmony? You're a sheep. Harmony: I'm not a sheep. Cordelia: You're a sheep. All you ever do is what everyone else does just so you can say you did it first. And here I am scrambling for your approval, when I'm way cooler than you are because I'm not a sheep. I do what I wanna do, and I wear what I wanna wear. And you know what? I'll date whoever the hell I wanna date. No matter how lame he is. I loved the moment when Cordelia stood up to Harmony and the minions. It was a long time coming for her to make a stand and finally decide if she wanted to be with Xander. We couldn't keep having this back and forth about their fling. She made the right decision to use her powerful position as the queen bee. No one would ever really challenge Cordelia....she is THE Cordelia Chase. Even though we already know this relationship ends in flames, it was a heartfelt moment to see them together. They seemed happy, and it fulfilled every '80s movie fantasy where the popular girl ended up with the dork. But, let's prepare ourselves for the trouble that will come in Buffy the Vampire Slayer Season 3. The storm is looming for Cordelia and Xander. What did you think of "Bewitched, Bothered and Bewildered"? Would you have forgiven Xander for doing the spell? Should Amy have been in more high school episodes? What's your theory of the rat spell? Want to join us in rewatching Buffy the Vampire Slayer? We'll be posting new rewatch posts every Tuesday and Thursday. Come back here and let us know what you think.